Master-planned Heron Lakes Golf Community is anchored by miles of lakeshore, impeccable views of Longs Peak and the winning charm of the Town of Berthoud. The Avanti floorplan is currently under construction at Heron Lakes and features the best of customized design inside and out. BERTHOUD – One of the most luxurious of luxury neighborhoods is now available in Northern Colorado. 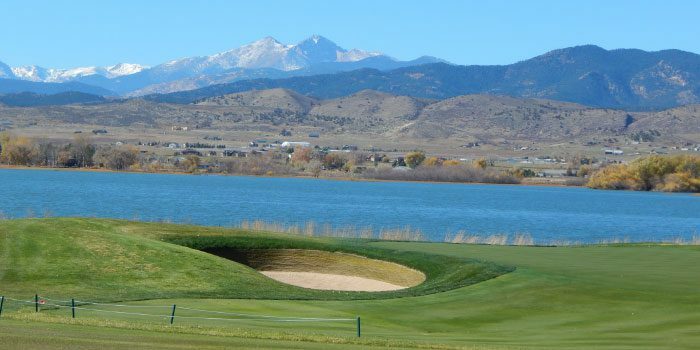 This summer the master-planned Heron Lakes Golf Community debuted Colorado’s only Tournament Players Club (TPC) 18-hole championship golf course and community, anchored by miles of lakeshore, impeccable views of Longs Peak and the winning charm of the Town of Berthoud. As a preferred Heron Lakes Golf Community builder, Lifestyle Custom Homes by Ed Rust delivers truly customized, meticulously crafted lifestyle construction design to families seeking personalized, efficient and lovely homes encircled by unrivaled outdoor sights and vibrant recreational opportunities. “While others boast ‘thousands’ of homes on their resume, Lifestyle Custom Homes by Ed Rust has always focused much more on quality than quantity,” said Melissa Doherty partner and broker associate with The Group, Inc. Real Estate, a Colorado real estate leader since 1976. Indeed, Doherty said, homes by Lifestyle Custom Builder have earned dozens of “Parade of Homes” and “People’s Choice” awards, and owner Ed Rust is celebrated nationally for his commitment to exquisite, thorough craftsmanship. Furthermore, Lifestyle Custom Homes can customize any floor plan as they have an in-house architect or buyers can use their own architect and plans. The Avanti floorplan by Lifestyle Custom Homes by Ed Rust is currently under construction at Heron Lakes and features the best of customized design inside and out. Settled in The Rookery, the gated community within Heron Lakes Golf Community, the completely custom Avanti floorplan by Lifestyle Custom Homes by Ed Rust includes membership to the TPC Golf Course at Heron Lakes. Future homeowners may now reserve lots with completion dates estimated in December, and the Avanti custom home at 2702 Blue Water in Berthoud is now available. Lifestyle Custom Homes by Ed Rust homeowners in the Rookery will relish mountain and water views from the comfort of a front court yard patio, complete with a cozy fire pit and must-see custom outdoor kitchen with BBQ on the back patio. A wide swath of open space backing to lots brings the wilderness home. Inside, custom ceiling beams strike awe throughout, and gourmet kitchens include Miele’ stainless steel appliances, custom granite slab or quartz counters and swoon-worthy, locally crafted European cabinetry. Walls stretch nine to 10 feet on the main floor and in the full basement, where entertainers will appreciate a dramatic wine cellar and lavish bar and golfers will love the golf simulator room (simulator not included!). The oversized master retreat is pure luxury, and each of the four bedrooms in the homes includes large walk-in, customized closets and individual en-suites. Likewise, energy efficiency is paramount: on-demand gas water heaters conserve energy without sacrificing convenience, and expansive three-car garages are always insulated and sheetrocked. Efficient windows bathe the open-concept home in light. Doherty explained, “Lifestyle Custom Homes by Ed Rust will start with either customizing one of our award-winning floorplans to fit your personal or family needs or begin with a blank sheet of paper and let your imagination be the designer.” Although Lifestyle Custom Homes by Ed Rust offers a more inclusive list of standard features than most, the builder also presents a myriad of rare options and upgrades. “Lifestyle Custom Homes by Ed Rust employs top craftsmen to provide the highest level of construction available and install only top-quality materials,” Doherty said. “They will keep you informed and involved throughout the entire construction process, from the very first meeting to the closing table.” Moreover, the builder, prioritizing customer service even after the sale, offers a detailed one year home warranty and top of the line customer service. Heron Lakes Golf Community is located on Highway 287 in Berthoud off of Interstate 25. Proximate to Denver and the Denver International Airport, Boulder and Fort Collins, the community bestows a menu of outdoor pursuits. In addition to the TPC golf course, the community offers almost nine miles of hiking and biking trails, neighborhood parks and hundreds of acres of passive open space. For water enthusiasts, the Heron Lakes reservoirs invite world-class fishing and boating, and a shoreline bar and grill encourages relaxed evenings by the lake. Heron Lakes TPC’s three reservoirs, Lonetree, McNeil and Welch, proffer unrivaled natural beauty and a plethora of wildlife, including a wintering herd of elk, bald eagles, osprey and the state’s largest great blue heron rookery. The Heron Lakes clubhouse was designed to complement the magnificence of the course and gated community. At about 55,000 square feet, the mountain lodge clubhouse beckons the community with a sports center, grand ballroom, fitness center, resort-style pool, restaurant and cafe. Berthoud itself draws residents to Heron Lakes. Nicknamed the “Garden Spot of Colorado,” Berthoud celebrates the charm and feel of a small town with annual festivals, parades and art events, as well as a network of parks and pools. “It’s truly the best of both worlds,” said Doherty, noting that Berthoud is close to shopping and restaurants in downtown Loveland and nightlife in Fort Collins. Andrea Schaefer and Melissa Doherty of The Group, Inc. Real Estate with Ed Rust, owner of Lifestyle Custom Homes. 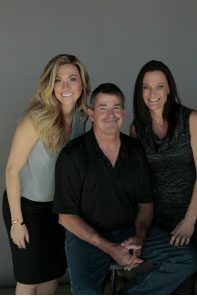 Melissa Doherty and Andrea Schaefer with The Group Real Estate, have been working together with Ed Rust for over 20 years. The history of this relationship shows how well they work together. Combined with the talents of the team and the commitment to help each other this is a truly a unique new construction experience. Doherty and Schaefer can help homeowners, with all the selections of a custom home. We really become friends with all our clients as we spend a lot of time together getting to know them. This process of building is something we take seriously, from helping create a floorplan for each individual buyer, to selecting the fine interior selections we are with you during the process. Doherty and Schaefer met over 22 years ago. They immediately had a go team attitude and started working together from that point. While both focusing on Real Estate individually they found creating Colorado Luxury Homes brand by The Group was the next step to achieving their real estate goals. “We love new construction and it shows”. Build time is seven to nine months. Don’t delay as some of the best lots are still available. Visit lifestylecustomhomes.com or follow CoLuxuryHomes on Instagram or on Facebook at ColoradoLuxuryHomes. By Sarah Huber for At Home. Photos by Lifestyle Custom Homes. Custom homes by Lifestyle Custom Homes by Ed Rust at Heron Lakes feature gourmet kitchens with stainless steel appliances, custom granite slab or quartz counters and locally crafted European cabinetry. Bathrooms are stunning with ceramic tiled flooring and spacious spa nooks. (Photo: Lifestyle Custom Homes).